Monday January 4th 1876 It was a very cold morning. But I was well wrapped up and did not suffer going to school. In the evening Ira took us girls down to church I did a little shopping. A bitter cold night. Tuesday January 5th 1875 I walked to and from school today. It was not quite so cold as yesterday. I had an excellent letter from Lizzie Lindley this evening. We talked some of going to church again tonight but concluded not to. So Ira went down town alone. I was sewing a little in the evening. When Ira came home he brought me a letter from Charlie and one from Mother. They had a party at home New Years night, and from Mother's description would judge they had a pleasant time wrote to her in the Eve. Mother is 49 years old today. 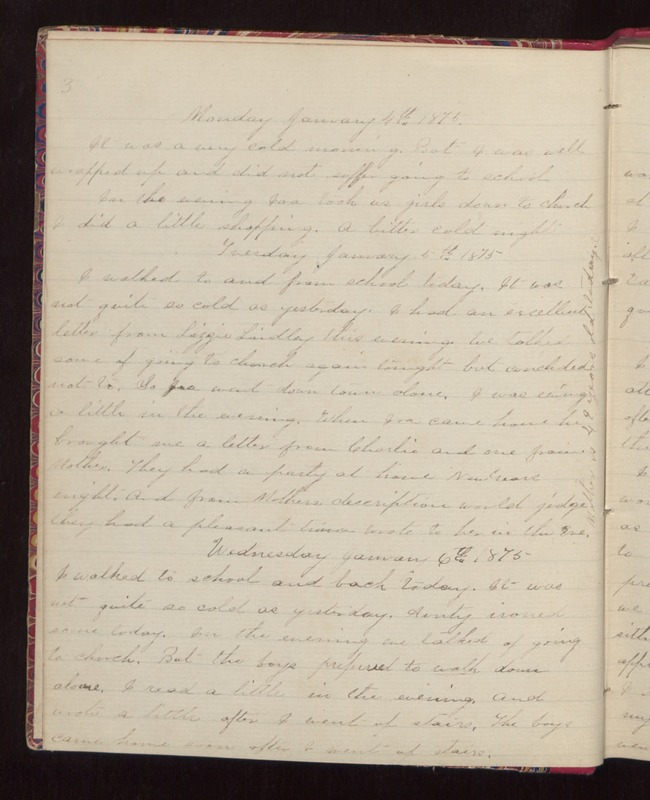 Wednesday January 6th 1875 I walked to school and back today. It was not quite so cold as yesterday. Aunty ironed some today. In the evening we talked of going to church. But the boys preferred to walk down alone. I read a little in the evening, and wrote a little after I went up stairs, The boys came home soon after I went up stairs.